As part of the WILDArt Event in Synevyr National Nature Park last week, the European Wilderness Society team and eleven artists visited two lakes. Synevyr Lake and Wild Lake. Please also read: WILDArt Plein Air Event in Synevyr starts today! 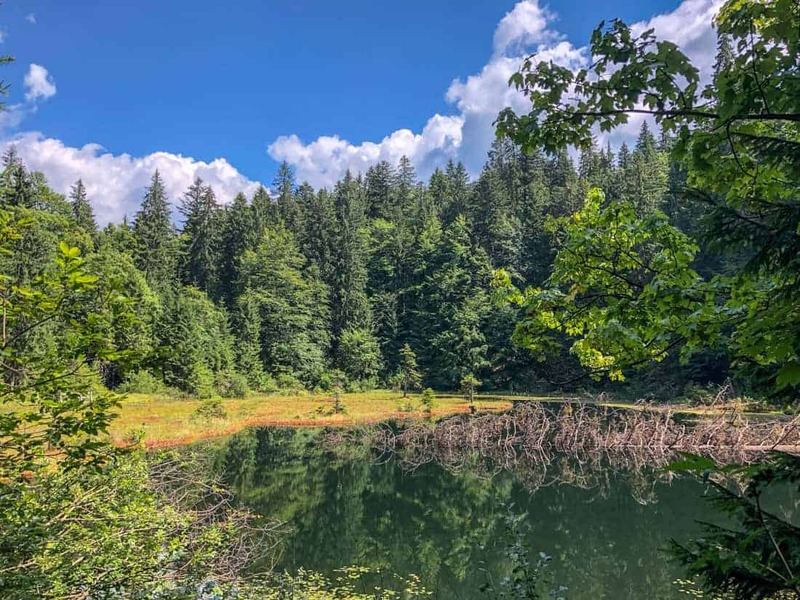 The lake was formed by an earthquake around 10 000 years ago, and changes dramatically with the seasons, covering 4 hectares in summer and 7.5 hectares in spring. Our guide from Synevyr National Nature Park told of two folk tales, one was the legend of Syn and Vyr which you can read about here. Whilst visiting the lake the artists were inspired by a 13m high structure of Syn and Vyr, carved into mahogany. The second folk tale was of a man that moved to the region from the coast, and he missed the sea so much that he prayed he would be able to see it again. The eye of the sea rose up and up into the mountains to see the man, and it became so high that it fell, and became Synevyr Lake. The trees that fringe the lake are the eyelashes. The next day the artists hiked from their base camp to the Wild Lake, led by Wilderness Director Vlado Vancura, where they camped overnight. This lake is special, because it is the only lake in the Ukrainian Carpathians with an island of spaghnum moss. This lake was a huge contrast to Synevyr Lake, because here there were hardly any tourists. It was quiet and peaceful, and the artists reached the lake in the early afternoon which gave them time to really feel the nature and let it inspire their artwork. However the lake can also be accessed by motorised vehicles, which meant we were able to clearly see negative impacts of previous visitors to the lake. This included erosion on the paths, litter and fire pits. This detracted from the natural beauty of the area, and the artists collected some of the litter whilst camping there. The European Wilderness Society will convey this message to the Park Management, and provide support to help protect this special area. We believe that future generations should have the opportunity to also enjoy this place.